Some may call it the Honey Moon now but, according to NASA's Astronomy Picture of the Day, June's full moon is traditionally called Strawberry Moon in North America because of the harvesting of the strawberries. 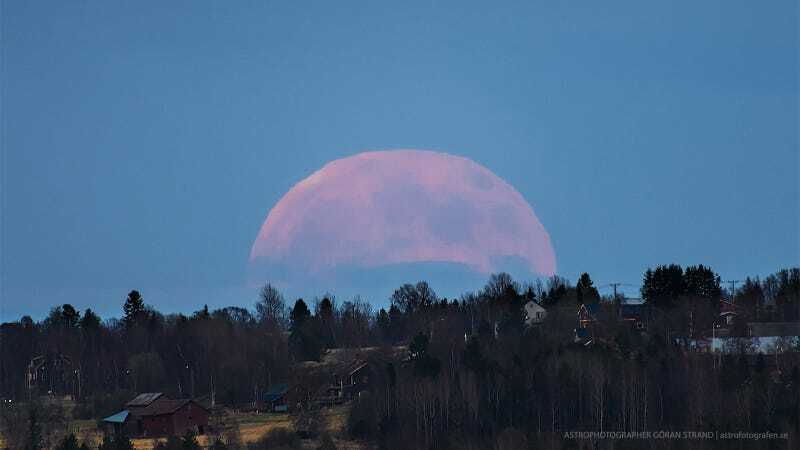 This incredible photo by astrophotographer Göran Strand shows a full moon pink and gigantic over Sweden. The Moon looks large in the image because the scene was captured with a long focal length lens from a place about 8 kilometers from the foreground houses. But just by eye a Full Moon rising, even on Friday the 13th, will appear to loom impossibly large near the horizon. That effect has long been recognized as the Moon Illusion. Unlike the magnification provided by a telescope or telephoto lens, the cause of the Moon illusion is still poorly understood and not explained by atmospheric optical effects, such as scattering and refraction, that produce the Moon's blushing color and ragged edge also seen in the photograph.